Intermec CN70e Non-Incendive - High Performance 2D Imager, Numeric Keypad, Camera, Wi-Fi Communication, Non-Incendive, Windows Embedded Handheld, WWE, Smart Systems. The Intermec CN70e is ideal for field-mobility applications that demand a compact form factor with no compromise on ruggedness. WWAN and 802.11a/b/g/n real-time data-collection capabilities in a variety of form factors, nearly indestructible keypad designs, unbeatable battery life, and onboard device-health monitoring sealed in an IP67 enclosure for use in Division 2, Class I""III, non-incendive hazardous environments. Vehicle Holder for the CK70/CK71/CK75. Does not provide power. Requires 805-638-001 Mounting Kit. 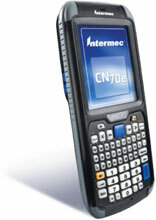 The Intermec CN70EN7KD00W1110 is also known as Intermec Technologies	INT-CN70EN7KD00W1110	.